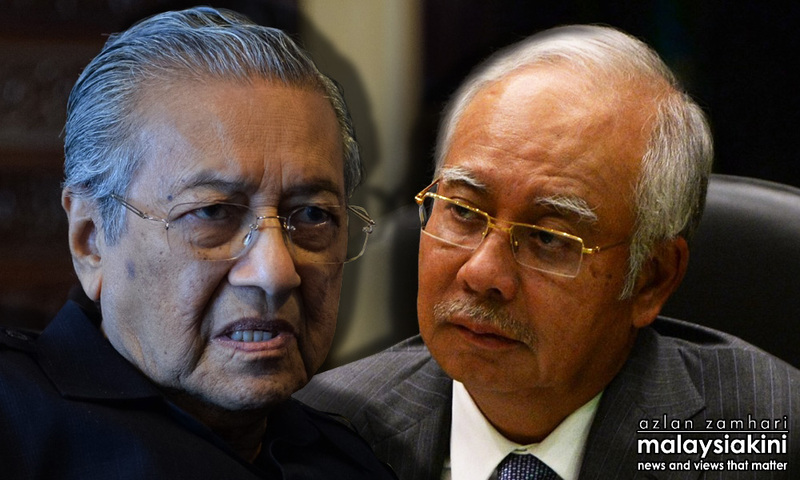 Last week's revelation by Federal Minister Datuk Seri Ismail Sabri that Tun Mahathir is going against Prime Minister Dato' Sri Najib is driven by personal anger (or dendam) due to several personal demands to Najib that were rejected deserves serious thought. Among other things, Ismal Sabri mentioned that Najib had rejected Tun Mahathir's requesst to privatize MAS to a friend, that another friend's sports betting monopoly license be approved as well as billions in aid to Proton. Let us go one step further to the events immediately preceding to the famous announcement in August 2014 that he had withdrawn support for Najib. I believe that these events over the 10 months period was critical to drive Tun Mahathir over the edge to go against Najib at all cost - which eventually led to the formation of Parti Prribumi Bersatu Malaysia and Mahathir's candidacy to be Prime Minister again. In September 2013, Tun Mahathir's son Mukhriz Mahathir defied calls that the status quo for the three Vice Presidents of UMNO to be maintained and decided to enter into the contest - despite Mukhriz having lost badly in the UMNO youth head election in 2008. Predictably, Mukhriz lost again in VP race with the results announced on October 21 2013. Tun Mahathir was obviously angry about his son's loss and had blamed Dato' Sri Najib Razak for not supporting his son and accused Najib of supported his cousin Datuk Seri Hishammuddin Hussein who had beat Mukhriz in the final position for Vice President. Further disappointment followed for both the father and son. Although Mukhriz had publicly stated his desire to be appointed by the president as one of the members of UMNO's Supreme council member, his name was left out in the 30 November 2013 announcement. Dato' Sri Najib had believed that Mukhriz was just given the post of Menteri Besar of Kedah and needed more experience and to prove himself before moving up the party. Furthermore, Mukhriz will still be attending supreme council meetings by virtue of his position as a Mentri Besar of a state. Therefore, there was no need for the additional appointment to be a member of the council. I am sure Tun Mahathir would not have been very pleased with this turn of events as Mahathir had said many times that "they still owe it all to me" and believed that he had elevated Najib as the son of Tun Razak to be president and thus the favour should be returned to his son Mukhriz. It is no surprise then that on the first day of the UMNO General Assembly on December 2, 2013, Mahathir shocked many by announcing that he was resigning as Petronas' advisor. He had cited that at 88 years old he is too old and that doctors had advised him to step down for health reasons. "His (Mahathir) departure, however, comes as relations with Prime Minister Najib Razak have grown strained in recent months, particularly over Najib’s refusal to endorse Mahathir’s son for an influential ruling party post. The Petronas board reports directly to the prime minister." Despite his reason of ill-health and being too old to be Petronas advisor, Mahathir then took up the more strenuous position of Chairman of Proton Bhd 5 months later in May 2014 . It is generally acknowledged that Mahathir had long considered Proton as his baby, his other son if you may. Proton had been running considerable losses since DRB-Hicom, owned by his long-time friend Tan Sri Syed Mokhtar, took the company two years ago. In doing so, Proton no longer belongs to the government and has become a 100% privately-owned company. Proton was deep in the red and had become a serious problem for the DRB-Hicom group. Over the past year before Mahathir became Chairman, the government had rejected repeated request from Proton for billions in financial aid on the grounds that it was a private company. It is generally acknowledged that making Mahathir as Chairman of Proton was to apply pressure on the government to approve a free grant of RM3 billion to Proton as aid. "The emergence of 88-year-old Tun Dr Mahathir Mohamad as Proton’s chairman will strengthen the national carmaker’s hand against the government . According to some people, it was Mahathir’s disappointment at the refusal of both Petroliam Nasional Bhd and the government to fund Proton’s RM3 billion transformation plan that prompted him to take on a more prominent role in the national carmaker," reported The Edge at that time. Mahathir himself had also repeatedly said that Proton deserves such grants from the government as Proton rightfully deserve it. However, this was not to be as the government continued to reject the request the request which led to Mahathir announcing he was withdrawing support for Najib's government in his blog-post on 18 August 2014. The reasons he gave then were unhappiness over the government policies of abolishing ISA, giving out BR1M, implementing the minimum wage and an accusation that Najib prioritized imported products over local products which was generally believed to refer to Proton. Nothing was said about RM2.6 billion or 1MDB in his announcement then. Ironically as the Pakatan's manifesto of GE14 shows, Mahathir has now U-Turned on the majority of those unhappiness that Mahathir had cited then in the form of more freedom, continuation of BR1M as well as further increasing minimum wage by 50% to RM1,500 per month. Previously Mahathir had written that the govt imposing a minimum wage of RM900 per month in the year 2011 would cause great inflation, cause our businesses to go into ruin and reduce the competitiveness of Malaysia. But now, his own manifesto wants to increase this to RM1,5000 per month. On hindsight, Mahathir must have felt deep disappointment and that his ego has been severely hurt over the treatment of his two prized sons in a span of 10 months - Mukhriz and Proton. He would have held Najib personally responsible and this disappointment would have manifested itself as burning anger and a great need for revenge. Two months after Tan Sri Muhyiddin was removed as Deputy Prime Minister, Muhyiddin had told the UMNO Supreme Council members that there're was indeed a conspiracy to topple Najib but that he was not involved. Muhyiddin also referred to the RM2.6 billion in Najib's account and said then he had no problems with this as he knows that it has always been the practice from way back when (dari dulu lagi) that there is a special UMNO president's account. Until today, Tan Sri Muhyiddin refuses to confirm nor deny what he said then even though an audio of his admission had been leaked for more than two years. After scheming for more than 2 years and failing to topple Najib while Mahathir was still in UMNO, Mahathir then left UMNO to work with Pakatan - including his former mortal enemies Anwar Ibrahim and DAP. Many DAP leaders had repeatedly said they were using Mahathir but Mahathir does not mind being used as long as he gets his goal to exact personal revenge. You also have to wonder what concessions that Mahathir had given to DAP and PKR to strike this unlikely alliance. This would also explain why Tun Maahthir has U-turned on almost every principle that he had before - Anwar, ISA, minimum wage, GST, DAP, controlling the press etc. He is merely using all possible angles, saying whatever he wants and doing whatever it takes to exact his personal revenge and smooth his personal dendam. Nothing is more telling than during the launch of the Pakatan Manifeto for GE14 weeks ago where his 45 minutes speech only mentioned the items in the manifesto a couple of times but he mentioned Najib's name more than one hundred times. As the head of Pakatan Harapan and the Prime Miinister candidate, Tun Mahathir should have explained to the people how wonderful his manifesto is, what problems this manifesto will solve, how the people will benefit and what his vision for the country is. Instead he used this golden platform to launch another series of personal attacks against Najib to assuage his personal anger. Truth be told, I am not even certain that Mahathir knows what is actually inside the manifesto . Not that he cares as his need for revenge is above everything else - even his own country's future.